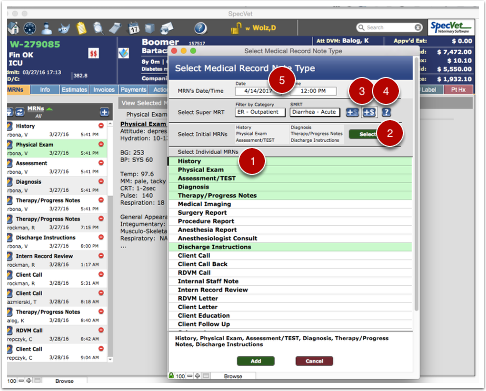 This section provides a list of all of the Medical Record Notes (MRNs) for this visit as well as buttons to filter, create and delete MRNs. This Filter Icon (or tornado icon as some people refer) provides you with an ability to filter the portal list of MRNs based upon specific criteria such as the MRN type, date, author, etc. The green triangular icon allows you to control the sorting order of the MRN Portal to be either chronologically or reverse chroniclogically. By default, SpecVet shows this list to you in reverse chron order, such that the newst MRNs are always on top. 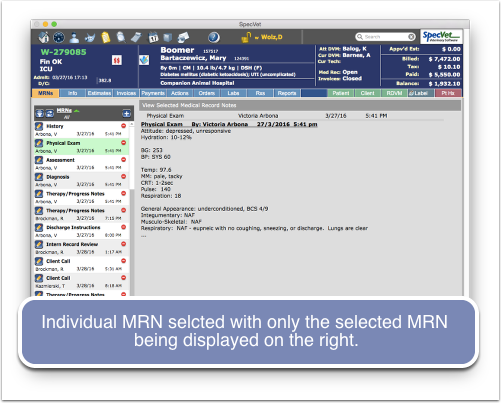 Select Individual MRNs to add just by clicking on the MRN type. Selected ones will highlight green. You can click again to deselect. Select the "Initial MRNs" to add. Again, you could then click a highlighted one to deselect. 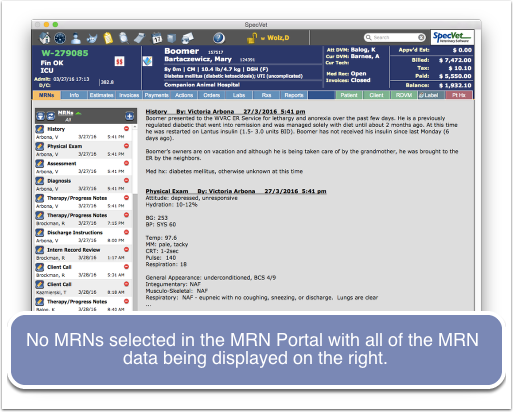 In the Portal List of MRNs, you are able to select an individual MRN by clicking in the "Center" of that MRN record row (where we have the callout). When doing that, the individual MRN will then be selected, highlighted in green, and in #9 below, only that MRN will be displayed in the MRN View Area. Selecting another MRN will then highlight and display that MRN in the MRN View Area. Clicking the selected MRN will "De-Select" it, it will remove the green highlihgt, and the MRN View Area will display the text of ALL of the MRNs that are in the MRN portal. 11. 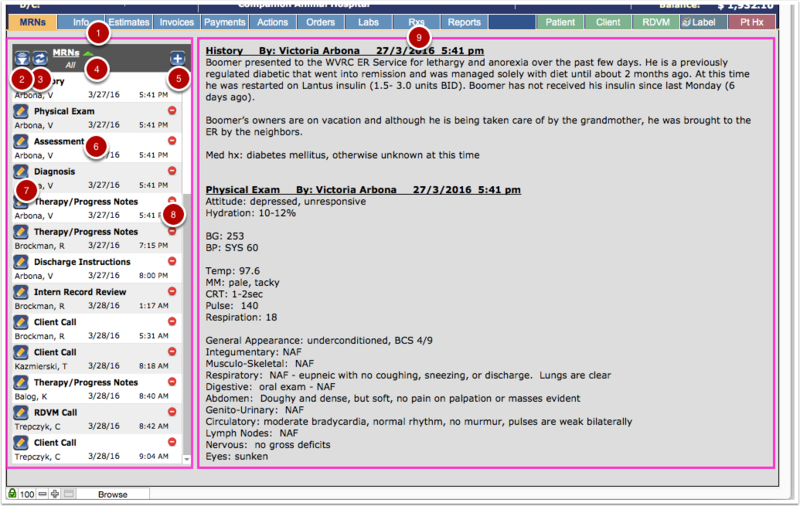 MRNs Tab - Medical Record Notes that have been added to the visit listed chronologically. These cannot be sorted but are viewed in the order they have been added to the record. Selecting the "Tornado" button in the top left of the MRN portal allows filtering of MRNs. Selecting the green "arrow" --------------------------------------allows ??????? best way to explain since it gets confused with sorting?